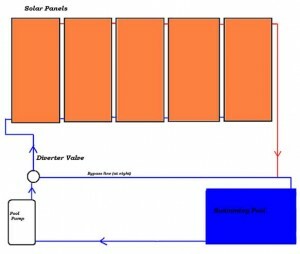 Solar Pool Heaters – Quantum Renewable Energy Inc. Solar pool heaters are an excellent use of solar energy. They cost just as much—if not less—than a gas heater, but require no fuel and start saving you money from day one. The material used to make pool collectors is resistant to the chemicals used to keep your pool clean, ensuring the long-term efficiency of your system. Typically, solar pool heaters raise the temperature of a pool from five to ten degrees, and in Canada they can extend the pool-use season by more than two months when compared to unheated pools. Solar collector: Typically a 4’ x 10’ panel made of black plastic/polypropylene material. These collectors heat up pool water when it flows through them, and they can be either roof or ground mounted. Diverter valve: This valve sends pool water up into the panels during the day, and prevents flow to the panels at night. This can either be done manually twice a day or automatically with an electronic control system. Pool pump: Circulates water through the collectors and back into the pool. No change in pump size is required; the same pump your pool currently has is more than sufficient. 1. The solar collectors capture the heat from the sun. 2. While the sun is out, a manual or automated diverter valve directs the pool water up through the panels, heating it up. 3. The pump circulates the warmer water back into the pool for you to enjoy. How long does a solar pool heater last? The standard lifetime of a solar pool system is 20 to 25 years. How much does installing a solar pool heater cost? The average 16’ x 32’ in-ground pool requires 6 four by ten – 4’ x 10’ panels. Systems with manual controllers start at $3500, and electronic controlled systems start at $4000. Please visit our Site Evaluation page if you would like a firm quote. What are the maintenance requirements for my solar pool heater? The only service requirement is at the end of the swimming season in preparation for winter. We provide a free system winter shut down visit in the first year to show you how to do it. Annual service visits are available after that at a cost of $75 each. The typical residential system takes one to two days, with no interruption to your pool use. All of our systems carry a complete two year warranty on labour. Equipment warranties vary from supplier to supplier, but they are generally ten years in length. A 25% deposit is taken at the start of installation, with the remaining balance due within 30 days. Can pool pumps handle pumping to the collector as well? Solar collectors only add approximately a 3-5 PSI load to the system. Since most pool pumps are greatly oversized to begin with, there shouldn’t be any issues. Will these panels shorten the life of my roof? NO. In fact, these panels will lengthen the life of your roof, since the sun is what destroys shingles. The solar collectors will not only shade the roof they are on, but when operating, they also remove the heat from your roof and transfer it to your pool. How much maintenance do pool systems require? The only maintenance a pool system requires is draining when you shut your pool down at the end of the year. The reason this must be done is to ensure that there is no water left in your pipes when winter comes, which could damage the system due to freezing. How much heat will the solar add to the pool? Typically a properly sized solar pool heater will add 10 degrees to an unheated pool.